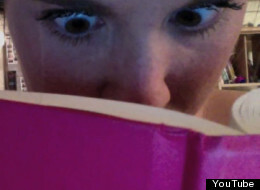 Cassidy Tucker (aka Cass Jay Tuck) reads a lot. She also makes a lot of videos, and has gained quite a following for her fun (and funny) YouTube book reviews. She also entertainingly opines, with more than a little sarcasm, about women in YA fiction, e-readers and English Majors. Her videos often feature music, text, fast cuts, special effects and generally a lot of silliness. Oh and she has a replica TARDIS in her room. In short: she’s our kind of nerd.